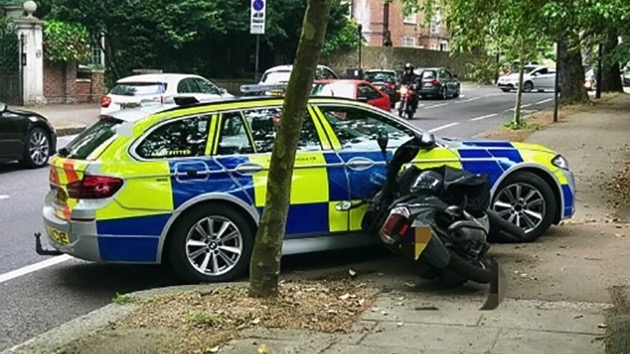 (LONDON) — A controversial tactic in which police in London use specially-trained drivers to ram criminals on scooters has triggered two separate investigations after the criminals had suffered “serious” injuries. The Metropolitan Police released footage last month of the policy, known as “contact tactics,” in action. The aggressive tactic is used in the hope that “potential offenders will think twice about their actions,” the department said in a statement. Police are legally obligated to make a referral to the Independent Office for Police Conduct (IOPC) if an individual is “seriously injured” during a police operation. This automatically triggers an independent investigation. The findings of an IOPC investigation are then sent to the police force — which is then required to act on the recommendations.